Posh 'keeper Luke McGee saves a penalty from Shrewsbury's Ian Black. Photo: Joe Dent/theposh.com. It’s looking more and more likely fine margins will determine the destination of League One honours this season. Clean sheets and the ability to nick a goal when needed will be key qualities so it’s probably for the best (and for the sake of their chairman’s blood pressure) that Peterborough United learn how to do both. George Moncur on the ball for Posh at Shrewsbury. Photo: Joe Dent/theposh.com. Certainly teams with promotion aspirations need to be put certain strugglers like Shrewsbury away with ease, even on their own turf. Things have been so bad at the Greenhous Meadow, talk of an imminent manager departure was rife before this game and it wasn’t a greedy, high-profile loudmouth they were referring to. Shrews boss Micky Mellon has overseen a home record so bad over the last season and a bit, those natives who haven’t already deserted the club are beyond restless. 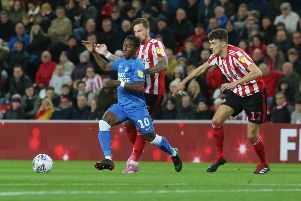 In short Posh had the perfect opportunty to end a winless run stretching back to the MK Dons trip in August. And quite how they didn’t pull it off would test the minds of Mensa members. Posh were so utterly dominant in the first-half, only the margin of victory seemed in doubt, and yet Grant McCann’s men were in need of a fine penalty save from Luke McGee to avoid an embarrassing defeat. McGee’s dive to his right to keep out Ian Black’s spot-kick put the lid on a crazy five-minute spell which saw a remarkable save at the other end followed by an instant Shrewsbury equaliser and a red card for Ryan Tafazolli for conceding the penalty, one that was awarded after a piece of defensive slapstick. Posh striker Paul Taylor takes on the Shrewsbury defence. Photo: Joe Dent/theposh.com. Paul Taylor was the man to suffer at the hands of home ‘keeper Jayson Leutwiler who somehow picked himself up after blocking George Moncur’s cross-shot to pull off a stunning stop from a close range drive in the 54th minute. Within 60 seconds the ball had been transferred to the other end and Black was looping a header over McGee to claim an unlikely leveller. And two minutes after that Tafazolli and central defensive partner Michael Bostwick got themselves into a right old tangle which led to the former shoving Antoni Sarcevic to the ground as he advanced on goal. It wasn’t definite the offence took place in the area and it wasn’t certain, under the new laws for this season, that Tafazolli had to receive a red card, but after some deliberation referee Darren Handley found in favour of Shrewsbury twice. Fortunately McGee came to the rescue and AJ Leitch-Smith slammed the rebound wide, and despite, playing against 10 men for half-an-hour a very poor home outfit didn’t threaten again. Posh deployed a 3-5-1 formation for the final stages, but understandably their own attacking game suffered. But McGee’s heroics shouldnt have been necessary. Posh had scored four on each of their last two visits to this venue and they could easily have matched that tally in the opening 45 minutes such was their grip on the game. Manager McCann named the same starting line-up involved in the weekend home draw with Walsall, but this time they started fast. Tom Nichols, a striker who needs a goal badly, headed Michael Smith’s fine cross over the bar after 90 seconds and missed the target disappointingly after making himself a decent scoring opportunity five minutes later. Nichols also poked a shot wide from right in front of goal Nichols after Taylor had met Marcus Maddison’s corner with his head on 25 minutes as every Posh set-piece proved a threat. Shrewsbury have been defending dead ball deliveries poorly all season according to the home press so Gwion Edwards’ goal with a header from Maddison’s free kick on 33 minutes came as no surprise. And that should have been the start of a goal avalanche. Edwards burst into the area within minutes, but couldn’t pick out one of many well-placed team-mates and Tafazolli was denied a headed goal by a fine save from Leutwiler when meeting another Maddison corner. Maddison was twice thwarted in the last couple of minutes of the first-half, first by a good save from Leutwiler after a rapid break and then by the woodwork as a rasping 25 yard strike struck the post. Shrewsbury had threatened rarely in the first-half with McGee kept busy only by two Shaun Whalley long-range shots. The way things have been going this season for Posh one always suspected one goal would not be enough and so it proved. It left McCann encuraged and frustrated at how events unfolded. He was right to be pleased with his side’s passing combinations in midfield before the break when Maddison, Edwards and Taylor often looked too hot to handle. He was also right to be satisfied with his team’s determination and discipline when reduced to 10 men. But McCann is no fool. He will know Posh should have won this game comfortably and he will also know that good football without good results gets you nowhere. Priority number one ahead of Saturday’s (October 1) trip to Southend should be to find a way to get Taylor and Moncur into the same side and working effectively. Moncur was often an isolated figure last night, far too far from the action around the Shrewsbury penalty area which is a crime for a player who does know how to finish. Posh: Luke McGee, Michael Smith, Andrew Hughes, Michael Bostwick, Ryan Tafazolli, Chris Forrester, Gwion Edwards, George Moncur (sub Hayden White, 62 mins), Marcus Maddison, Paul Taylor, Tom Nichols (sub Deon Moore, 74 mins). Unused substitutes: Nathan Oduwa, Leo Da Silva Lopes, Callum Chettle, Jack Baldwin, Mark Tyler. Shrewsbury: Shrewsbury: Jayson Leutwiler, Joe Riley, Ryan McGivern, Adam El Abd, Junior Brown, Ian Black, Shaun Whalley (sub Louis Dodds, 72 mins), Jack Grimmer, Antoni Sarcevic (sub Moha Choulay, 80 mins), Gary Deegan, AJ Leitch-Smith (sub Andy Mangan, 74 mins), Unused substitutes: Mark Halstead, Jim O’Brien, Sylvan Ebanks-Blake, Olly Lancashire. Goals: Posh - Edwards (33 mins). Shrewsbury - Black (55 mins). Sending-off: Posh - Tafazolli (denying a goal scoring opportunity). Cautions: Shrewsbury - McGivern (foul), Black (foul).